Show the Filipinos and the world why it’s more fun in the Philippines! Join Escape Manila as he travels the Philippines overland non-stop from Mindanao to Visayas and Luzon and back to Mindanao for 50 days. 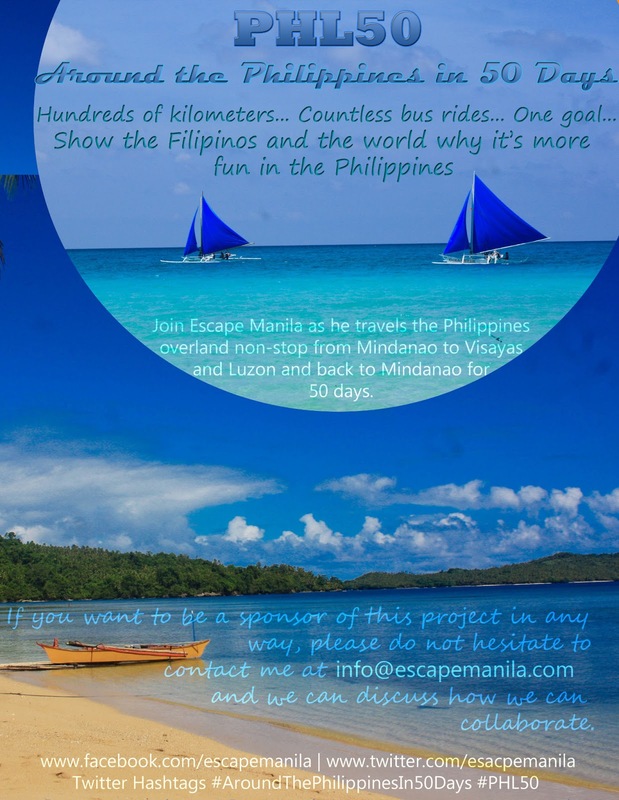 If you want to be a sponsor of this project in any way, please do not hesitate to contact me at info@escapemanila.com and we can discuss how we can collaborate. Your support is very much appreciated and I hope to see you when I visit your town. Updates about the Itinerary of this project will be posted on twitter and my facebook page. 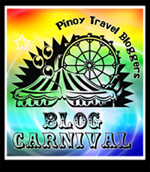 This is my entry to the Pinoy Travel Bloggers’ Blog Carnival for January 2013 with the theme “New Beginnings” hosted by Roj Braga of The Adventures of AdventuRoj. Nice! Good luck to this journey. I am looking forward to the places you will visit. Be safe! Good luck to your 50 day journey around the Philippines. Looking forward to your updates on this journey. Intense! That looks like a fun and interesting trip. I would like to read about how you budget and where you'll stay if ever I decide to do that too. goodluck to your journey will be helping to spread the words! and hoe you guys will make it to success! goodluck all!! Something I'd like to do myself. Looks like a good plan, taking your travel to the next level. Gusto ko rin gawin to. 🙂 Good luck to you! Uhmmm I hope you can include SOCCSKSARGEN in your itinerary, we have a lot of interesting places for you to visit and your group will surely enjoy..
Good luck! I think this is a great and creative way of promoting the beauty of our country and the spirit of our people! wow! ang gandang ideya nito to promote ang ating mahal na Pilipinas. good luck sa paglalakbay mo. At umasa ka na i-share ko ang bagay na ito sa aking mga kaibigan. I'm in loved with the idea. I'm a fan of the 100 Days Rejection Therapy by Jia Jiang and an advocate for local tourism so this idea really caught my attention. Safe travels and will link you up with my contacts in Iloilo =) Have fun! Great way to start the year! Having this advocacy to promote Philippine tourism by initiating such project. GOOD LUCK on this. good luck, hope you have a successful and meaningful trip and may the Lord be with you the whole duration of it. Yahweh bless. Wow, good luck to your endeavor!